IKEA released the most gorgeous “Celebrate” press kit this week and I absolutely have to share this. 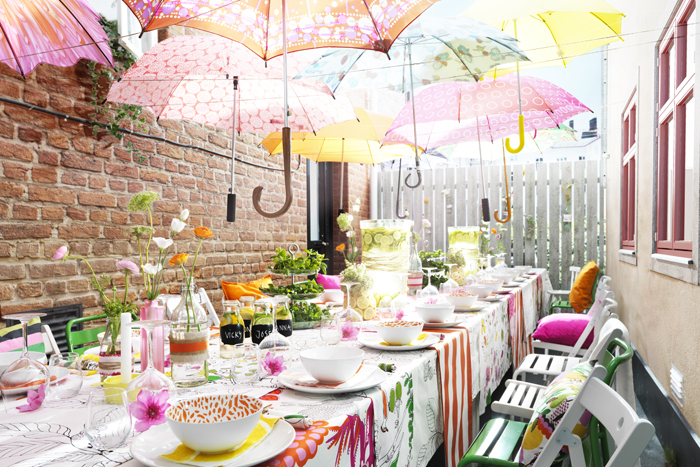 Summer is all about have a great time outdoors and IKEA has put together a gorgeous outdoor setting to inspire you. Whether you’re throwing a graduation party, a bridal shower, baby shower, or just a reason to get together with family and friends, this beautiful garden inspiration will give you a few ideas to DIY. Have you started decorating your outdoor space yet? If so, what colours are you injecting? Mine so far includes greens, oranges, and yellows, I’ll be sharing some of my own photos soon! I particularly LOVE the hanging umbrellas (KNALLA umbrellas $3.99/each)! It’s the perfect DIY way to shield your guests from the blazing sun and also give you an opportunity to introduce different patterns and colours to your space. 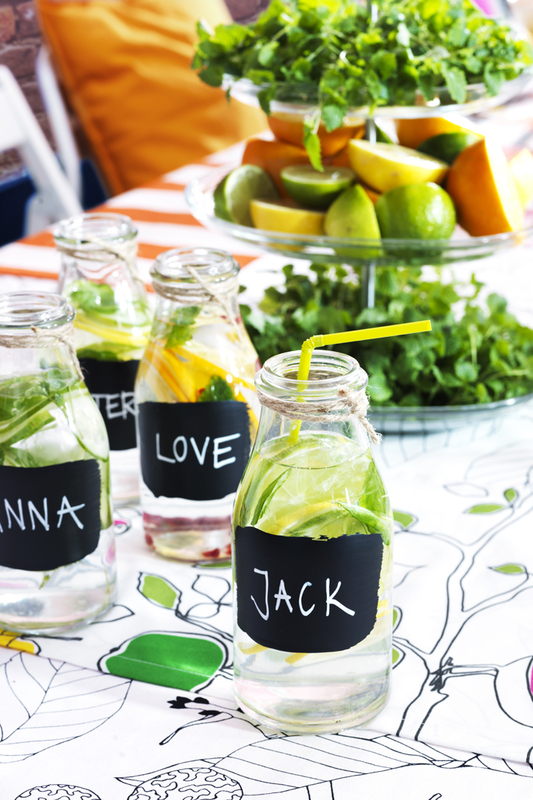 I’m totally into chalkboard paint lately, it is so easy to just add a paint stroke to a glass vase or jar for drinks. ENSIDIG vase $0.99 each. 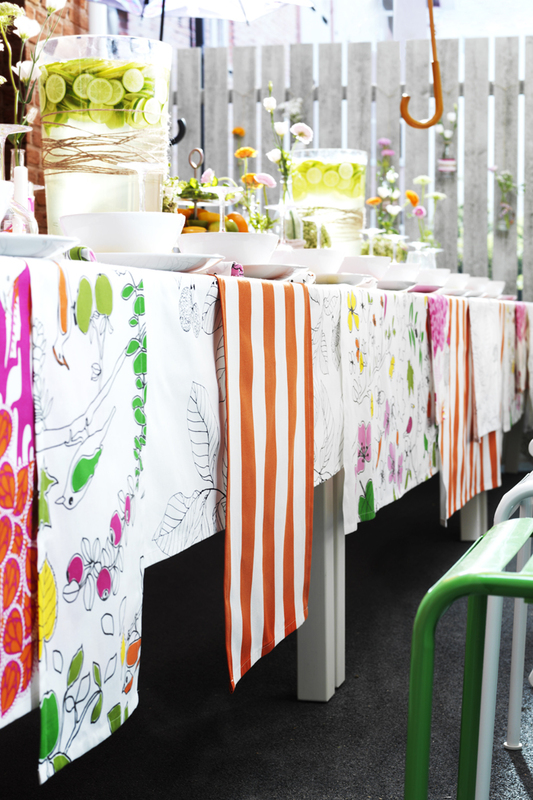 Here is a simple DIY by creating a colorful and fun table cloth by pairing multiple strips of fabric. 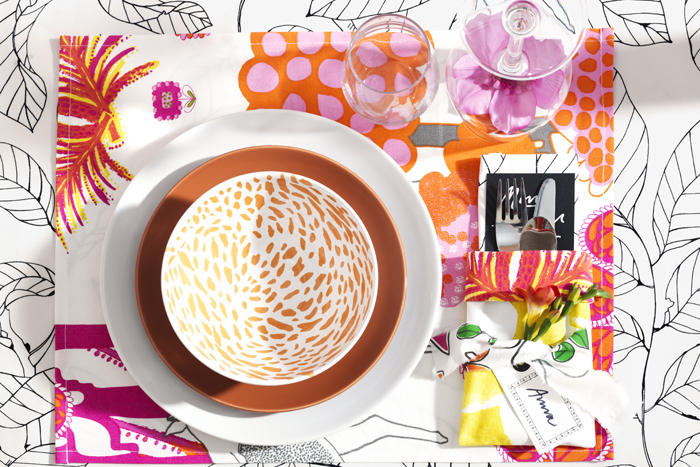 You can also change up the theme for your next party by adding new fabric patterns. I love this idea and must try it myself! LUDOVIKA fabric $3.99/m, SOFIA fabric $7.99/m. 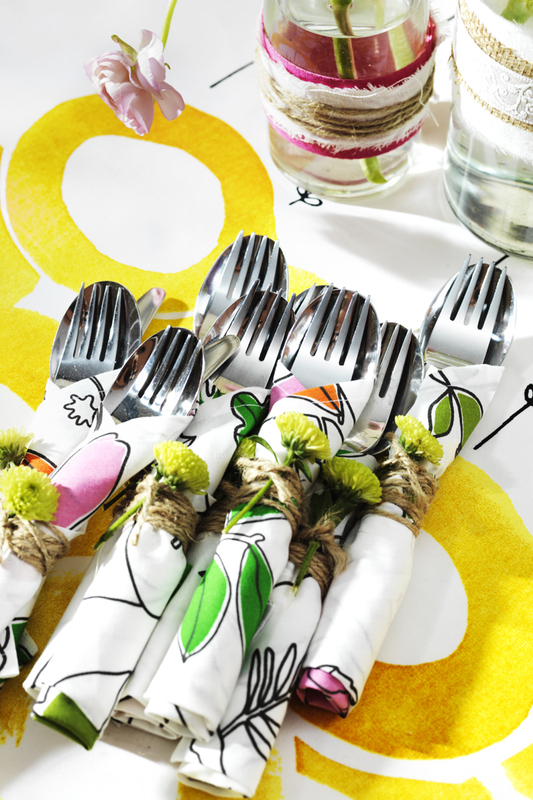 The leftover fabric you have from the table cloth project (above) can be used to as napkins to wrap your cutlery with. Add some sprigs of fresh flower (or I’d also try a nice smelling herb like rosemary) and it sure to be a crowd pleaser. Top off the table setting with matching place mats (easy sew job by tucking in the edges and running them through a sewing machine) and dishes and you’ve got the recipe for the perfect meal. ALGORT fabric $6.99/m, STOCKHOLM fabric $7.99/m DRIFTIG bowl $3/each. IKEA’s got the most affordable assortment of frames. I actually purchased most of my frames from IKEA. 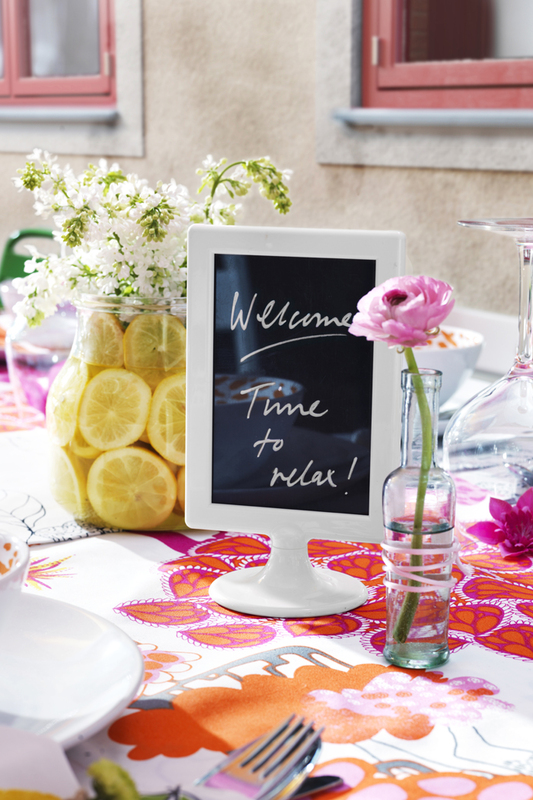 Why not give your guests a sneak peek to the menu by showcasing it with a frame! TOLSBY frams for 2 pictures $0.99/each. I always struggle with center pieces and have a hard time trying to figure out what assortment of items to display. Here, a terrific array of bottles and vases in varying sizes adds both depth and dimension as a center piece. KORKEN bottle with stopper $2.99, ENSIDIG vase $2.99. 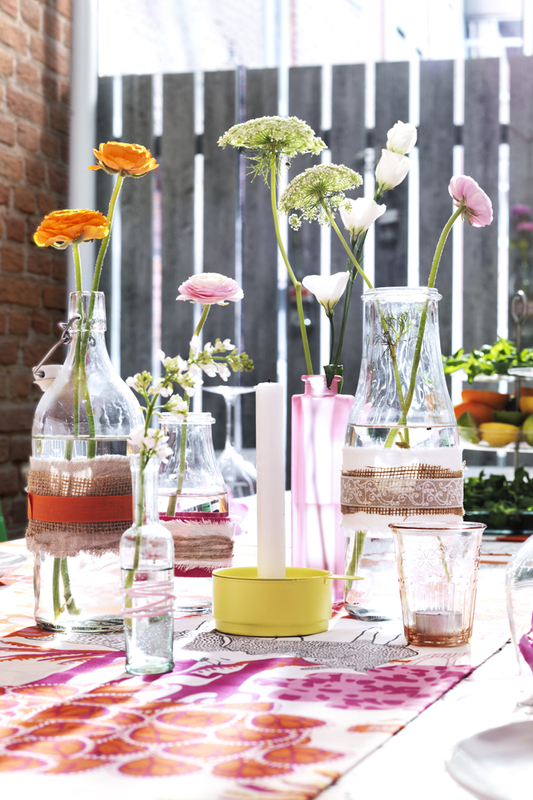 I hope these simple tips from IKEA (and yours truly) will inspire you to pick up a few cheerful items and throw a summer party for your BFFs! I’m absolutely looking forward to my next BBQ party and will definitely be using a few of these ideas myself. If you’re more into staying under budget, have a look at my Thirft Store Show Down Challenge on The Marilyn Denis Show for even more affordable ideas!